Exit I-20 at Great Southwest Parkway - S. 1 1/2 mile, merge into Lake Ridge Parkway - S. 1 1/2 mile, entrance to Lynn Creek Park on East. On west side pass gate, walk SW 1330 feet, cemetery on left 150 feet. [Mapsco Fort Worth 112-L] Need permission from Corps of Engineers to access cemetery. Cemetery recorded and photos taken Nov. 19, 2009 by Tom Cogdell. Located in a remote area in the western part of Lynn Creek Park (Joe Pool Lake – Grand Prairie, Texas – Tarrant County) at an elevation of 537.9 mean feet above sea level, about 2 feet above the flood control pool. Access is by footpath, about ¾ mile from the nearest road. In 1979 the Grand Prairie Fire Department opened a new fire station within whose district, in southeastern Tarrant County, a tiny pioneer cemetery was located. Fire department personnel found out about the cemetery when making several calls to extinguish brush and grass fires in that area. 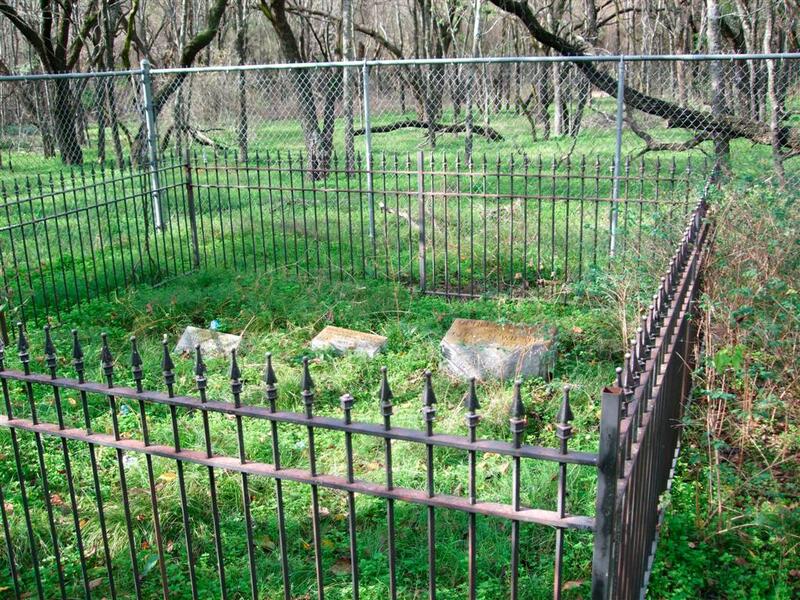 It was reported at that time that two grave markers were nestled behind a beautiful iron fence. One, a baby’s gravestone, soon disappeared. The other stone, inscribed “Ophelia Wilson,” vanished several months later. Vandals had become active in the area. Local teenager’s known to have had late night beer parties there were suspected. Not only were the tombstones removed from the plot, which had become locally known as the Wilson Cemetery, but a story began to circulate that Ophelia Wilson had been a “scarlet lady” who had been killed at the site. The story appeared in a local school newspaper. Meanwhile, the land on which the Wilson cemetery is located was purchased by the federal government for the construction of a large reservoir, Lake Joe Pool. Ophelia’s headstone, painted red by vandals, was found by a U S Army Corps of Engineers park ranger in a ditch on July 13, 1980, and was stored at the lake project office. The iron fence surrounding the cemetery disappeared some time between November 1980 and February, 1981. It has not been recovered. By 1980 the Tarrant County Historical Commission, whose statutory responsibilities include a project to preserve pioneer cemeteries, had persuaded Tarrant County Commissioners Court to create the Tarrant County Cemetery Trust Fund. 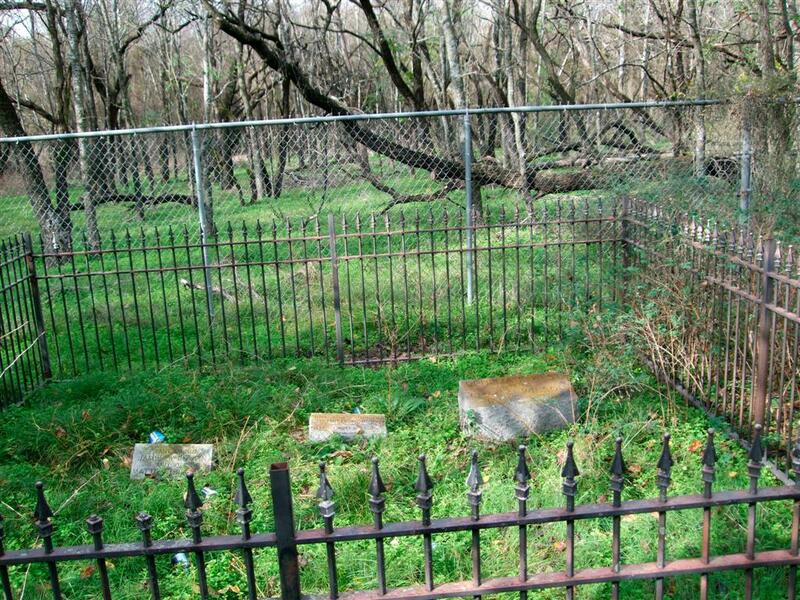 The purpose of the trust fund is to provide basic preservation and maintenance for Tarrant County’s pioneer cemeteries. On the list of specific cemeteries for which trust funds were earmarked is the Wilson Cemetery. 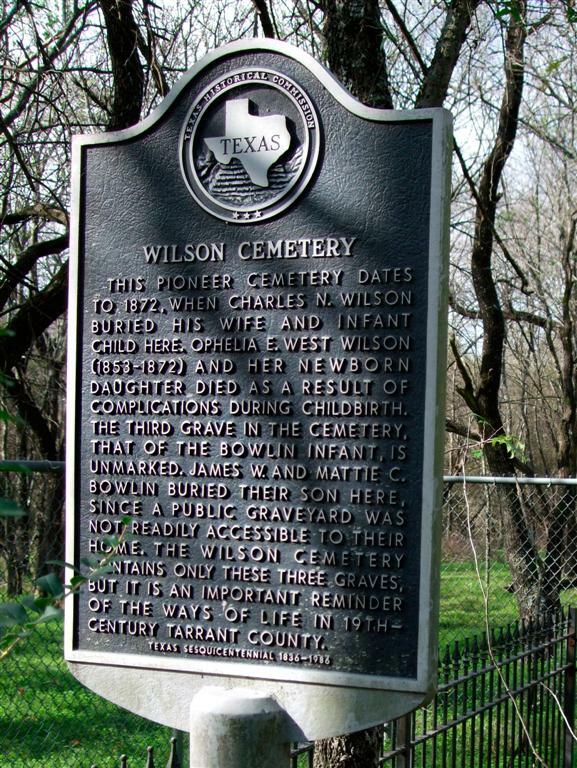 In 1981 an effort was under way to restore the Wilson Cemetery and place an official Texas historical marker at the site, so that local citizens and lake visitors would be made aware of the historical significance of pioneer burial sites and of the importance in preserving them. In 1872, four years before railroad lines reached Tarrant County a wagon train on the way to California passed through the Webb community in southeastern Tarrant County (the exact date is not known). Among the wagon train were Charles N. Wilson and his wife, Ophelia E. West Wilson, who was about to give birth. According to a local tradition, Ophelia Wilson went into labor just as a storm came up, whereupon Charles Wilson advised the wagon train to go on and he would catch up with them later. There were complications during the birth, however. The mother and child, a daughter, both died. When the storm had passed over, Charles Wilson buried his wife and child, then went down to a nearby creek and dug up four oak saplings and planted them at each of their graves, to mark the site until he could return. After his wife, Ophelia, and child died, Charles Wilson went to a farm house that was closest to that location and advised the man there that he would return someday with gravestones and mark the graves. The farm happened to be that of William Lynn, an early-day Webb settler. Lynn passed the account of the Wilson tragedy on to Elvis Lam, a Dallas Resident (who had raised Red Angus cattle on a farm in the Webb community, a farm once owned by his grandparents). As a youngster, Lam stayed with his grandparents during the summer, at which time he learned the community’s heritage from “Uncle Billy” Lynn’s recollections. Around 1893, a third burial took place at the Wilson Cemetery, that of an infant son of James W. Bowlin and Mattie Curry Bowlin. The infant was their first born child, and died at birth or shortly thereafter. Since there was not a readily accessible public cemetery, the Bowlins decided to bury their child next to the “pioneer woman”. Wilma Bowlin Green and several other surviving children of James and Mattie Bowlin have visited the site periodically through the years. No headstone or marker for the Bowlin child was erected. According to Mr. & Mrs. Otis Skinner, who are Webb residents, in the early 1930’s, a woman came to the area looking for the Wilson graves. The Skinners, who lived nearby, showed her the location. Later, Skinner helped her erect an iron fence around the plot, and set two headstones. The woman identified herself as Charles Wilson’s daughter. The Skinners recall that she was from Houston, that her name was not Wilson, and that she was not a young woman. Attempts to further identify the woman, or locate next of kin, have been unsuccessful. Elvis Lam remembers that when he was a youngster, his grandmother, who did a great deal of canning, would ask him to deliver jars to a nearby relative’s house. To reach that house, Lam had to pass by what local residents had come to call “Ophelia’s grave”. On the way back, if he was empty-handed, he would climb the fence and clean grass and weeds from the graves. As years passed, the small cemetery was virtually forgotten, since it was on private property and was not visible from the road, lying about 200 feet east of Ragland Road, which is being vacated and abandoned as a result of the Joe Pool Lake Project. Recently, the U S Army Corps of Engineers has marked the graves, including Ophelia Wilson’s original maker, and has enclosed the site with an iron fence nearly identical to the original one place there in the 1930’s. For additional protection, a locked chain-link fence has been placed around the cemetery. Oak logs, believed to be remnants of the oak saplings that Wilson planted at the time of his wife’s and infant daughter’s deaths, lie just outside the fence. 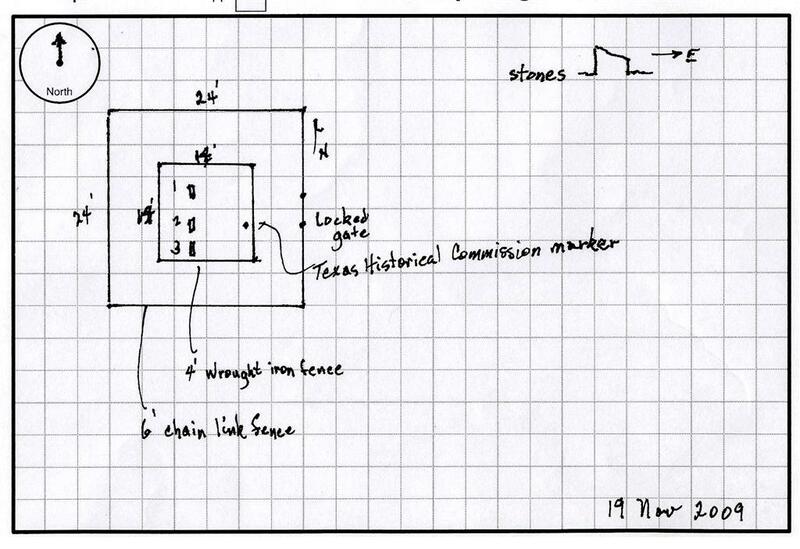 Sharing that belief, the Texas Historical Commission, in cooperation with the U S Army Corps of Engineers, has approved an official Texas historical marker for the Wilson Cemetery. The Tarrant County Historical Commission will install the maker later this year.